Craig Conley is the prodigious and prestidigital sorcerer of an esoteric and arcane empire of wonder, curiosity, and knowledge. The temporal but impalpable centre of the many projects which are his bailiwick can be found at his Abecedarian blog. His many books, including Ampersand, Dictionary of One Letter Words, Magic Words: A Dictionary can be found through his website. One of my favourite of his books is the intriguing and poetic, If A Chessman Were a Word: A Chess-Calvino Dictionary. And now he has a new book out: Divination by Punctuation. 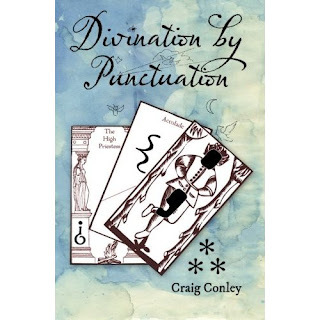 He has devised a new Tarot deck based on, amongst other insights, that punctuation is a kind of connective -- it can indicate the many types of relations between one card and another. It is, as all of his books, beautifully pataphysical, poetic, engaging, intriguing, and filled with many fantastic quotes, facts, and great illustrations. There's a review and an interview with Craig over here at Bonnie Cehovet's blog. (I should mention that, in the book, Craig graciously quotes me waxing gibbous about punctuation. Between one great continent and the other, there is the vast ocean. Between one sentence and the other, punctuation. I loved your comments in the book on Craig's work. :) Everything he does is new and different - and worth checking out! And I agree about Craig! Adam in Victoria recommends this book, sez he is a friend of the author.